So what is a freeroll? A freeroll is a kind of poker tournament whereby participants do not need to pay a entry fee to join. 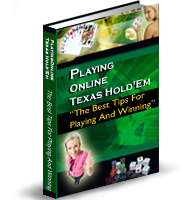 They’re primarily played to get understanding of the game of poker and for players to enhance their skill. Freerolls are available at most poker sites on the internet with differing amounts of registrants and prize pools. Sites also give an incentive to players for their loyalty to the room with special freerolls. These normally have a much higher prize pool and much lower field of players. Experienced poker players feel poker freerolls are useless becuase they are filled with bad players and bad play. However if the play was similar in any other game, they’d say how wonderful it is, so why is it different for freerolls? The answer is it is not, freerolls are a good way to build your bankroll and fairly easy once you know the way to play. So next in the article, is the perfect strategy to win freerolls. The kind of freerolls this strategy should be used for are the general tournaments that are offered to anybody and not the ones that require player points or a number raked hands as these games have a better standard of play. To place in poker freerolls, you need to have a strategy which ensures you stay in the tournament but still have plenty of chips left so that you can go for the win. As freeroll pay out structures are likely to be top heavy, you need to go for the top positions as you will only be winning pennies if you finish anywhere outside the top 5. To reach these positions you will need a bit of luck and alot of skill. The main challenge is to just outlive the first hour in a freeroll, so to start we are going to examine your opening hour strategy. In the opening hour, play is at its very worst. You will be facing quite a few opponents, happily risking their chips each hand because they know they’ve got nothing to lose. At this time in the tournament, you should keep it tight and play fewer hands as you normally would when you’re out of position. Only call an all-in with one of the top 5 hands because it is likely you will end up facing more than one opponent which dramatically reduces your chances of winning the pot. You should also when as many cheap flops as possible, but only if you have position on the entire table. Optimum position is the dealer button, where sub-par hands become reasonably strong and worth a call so long as the pot has not been raised. Hands will be more worthy of a call at this stage just like you hit a monster hand and you will more then likely be paid off. I would especially call suited connectors in late position, as any straight or flush is quite likely to double or even triple your stack. About half an hour into the tournament a lot of the bad players will have been wiped out and play is at a higher standard. Blinds will be higher and may also be worthy of stealing depending on the blind structure. You need to be collecting as many chips as possible coming up to the break because they will be much needed in the next stage of the tournament. You can begin to loosen your play if you are in earlier positions now and hands like AJ become playable. As you are nearing the break you might find that play on your table becoming much tighter, as players don’t want to be eliminated ahead of the break. This is the point in which you really need to become the aggressor on the table. Start raising more pots and try bullying players with less then average stacks. You will find your stack increasing constantly and you will be climbing the leader board. When the break approaches, take a rest and refresh yourself. The next part of the tournament really makes or breaks the game. You need to be fully focused if you want to reach your goal of the top 5. The middle stage decides whether you’re making money from the tournament or be leaving empty handed. You will see play directly following the break is much looser the immediately before it. You might calm down and be ready to fold hands and see the other players battle it out. Needless to say you still should be taking down pots. Steal pots anytime you can and by now you ought to know the weaker players at the table. Use this to your benefit and then exploit them. You want to be above the average players chip stack. As the bubble approaches play changes very much like when the break was imminent. Players will tighten up and practically stay out of all hands supplying you with a great opportunity to steal more pots then usual. I would advise you to stay clear of stealing a pot which involves the player with the highest amount of chips on your table. This is becuase they will not be bullied off a pot as easy as others. Lower stacks will usually fold their hand when you apply this strategy. Your stack will grow from winning just a couple pots this way and you will start climbing the leader board. Following the bubble has gone players with low chips stacks will be ready to go all-in with every hand. This is a complete change from their pre-bubble strategy since they’re happy to have made money, but know they will need to double up to be able to finish in a position to make real money. You again need to tighten up and only play your premium hands, but also picking your spots and using your position to take down pots. This then will take you to the final table which is the final stage of the freeroll. since you managed to get to the final table in the poker freeroll, congratulations your hard work has paid off. Of course you’re now here to finish as high as possible. Continue your play tight until there is Five or six players left. You then should play super aggressive and begin stealing pots whenever you can. You might have to pick a spot to double up if you are getting short stacked. If you’re still in the tournament when play is 3 handed you are in a great position. Your play now really depends upon your personal preference. If you are pleased to finish second, let the other two players to battle it out and knock one another out. If you’re going for glory, play in the pots. When there is only 3 players left, average hands become stronger and worthy of a raise. You need to get your money in with any Ace and you’re likely to be ahead. If you played to finish second, when your heads up you’ll probably have a smaller chip stack and you should push with any decent hand. If you went for glory and were able to knock the other player out, now you can use your chip stack to bully your opponent. Make sure you are forcing them to risk all of their chips when you’ve got any kind of hand and eventually you will knock them out. They may double up a few times but if you don’t get incredibly unlucky, you should win the tournament. So, there you have it. Stick to the steps for each stage and you’ll be making more money then ever from playing both online poker freerolls and sit down freerolls.